Guntersville-Republican State Rep. and Lt. Governor-hopeful Will Ainsworth took to the airways ahead of the holiday weekend with a new ad calling out his opponent Twinkle Andress Cavanaugh. “Career politician. Bureaucrat. Special interest lobbyist. Twinkle even supported the largest tax increase in Alabama history. Twinkle Cavanaugh, another tax-loving lobbyist bureaucrat turned career politician,” the ad asserts. Cavanaugh is referring to the fact when Donald Trump was running for President, Ainsworth called him “a con artist,” a “liberal,” and “not a conservative,” said that Trump’s campaign for President was “a ridiculous act,” and even declared that President Trump needs to be stopped. 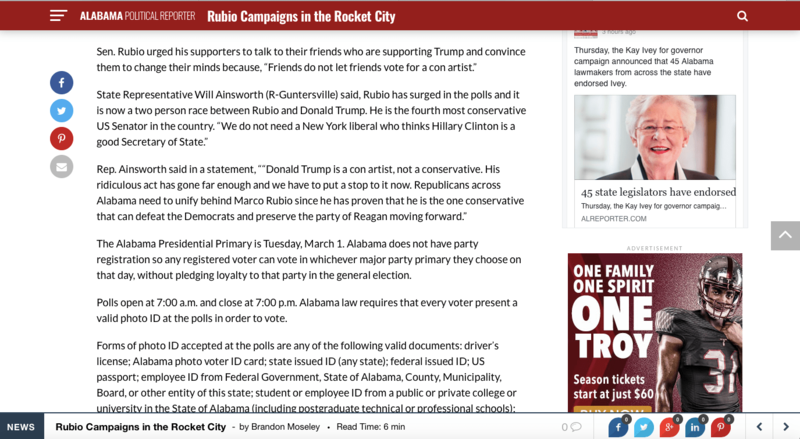 Ainsworth’s comments on Trump as seen in a 2016 Alabama Reporter article. “I’m calling on state legislator Will Ainsworth to immediately apologize to President Trump and Governor Ivey. What he’s said about both of them is just plain wrong,” concluded Cavanaugh.